NEW YORK–Many of our nation’s military veterans return home and experience Post Traumatic Stress Disorder, and struggle to contend with the condition. They are our neighbors, coworkers, family, and friends. Artist Susan J. Barron recently undertook a project to raise awareness about PTSD, and to try to help those who battle the condition. Barron is an award winning artist, and when she found out that 22 veterans commit suicide every day, she felt compelled to do something. 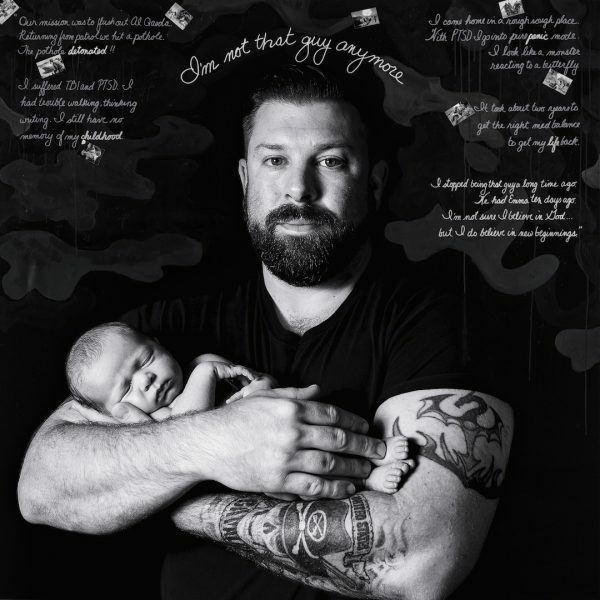 That’s when she decided to embark on a noble endeavor to create a gallery project called “Depicting the Invisible: A Portrait Series of Veterans Suffering from PTSD,” in an effort to bring awareness to the issue. In 2017, Barron started meeting with veterans. She began working on the series in 2018. 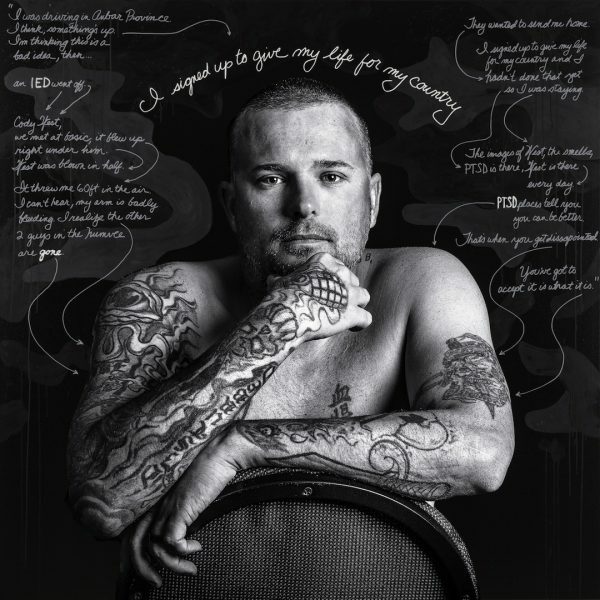 The series features veterans from all around the country and tells their individual stories. First, she spent a long period of time speaking with the veterans over the phone to gain an understanding of their stories. After really putting in the time to get to know them, she traveled and met with each veteran. Throughout the project Barron learned that the invisible wounds of war like PTSD are often just as severe as the visible ones, sometimes more so. Furthermore, she grasped that many veterans don’t see the condition as a disorder, but as an injury, and it’s harder to get help for something one can’t see. 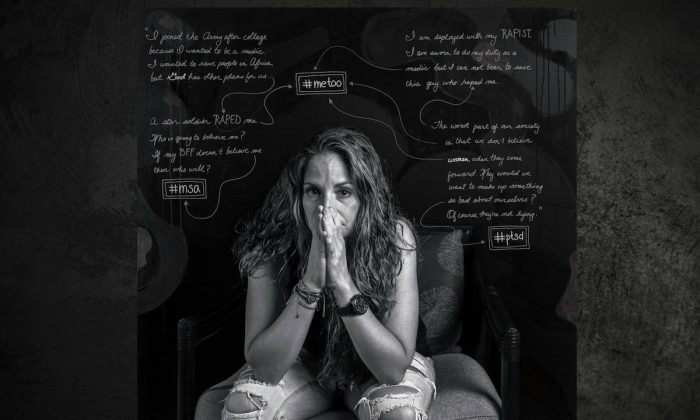 Her mission is to give veterans with PTSD a voice, bring awareness to the suicide epidemic affecting out veterans, and help them receive the help they need. Moreover, she hopes civilian viewers will realize the sacrifices our veterans make, and hopes the series will inspire them to get involved and help. One of the veterans in the series is 52-year-old Craig McNabb. The army veteran was deployed to Iraq in April 2003 and returned in April 2004. During his deployment, McNabb had his fair share of unpleasant and traumatic experiences. For instance, he vividly remembers being transferred on a C130 aircraft that had taxi cab yellow boxes filled with the remains of fallen marines. As he sat next to them during the flight, his mind began to play tricks on him. He thought he could smell them. And to this day when he sees the color taxi cab yellow, depression sinks in. The memory of his friend and lieutenant colonel being shot in the chest is just another of countless of traumatic events that have stuck with him, and is also a trigger for his depression. Life was completely different when McNabb came home, and he struggled to adjust to civilian life. Every day there is something that reminds him of the war. “My mind and body wasn’t actually here. It was still back in Iraq,” McNabb told The Epoch Times. McNabb also experienced severe anger issues, anxiety, and depression. If he was in a shopping mall or a place with a lot of people he felt threatened and compelled to leave because he thought people were closing in on him. He eventually sought treatment, and continues to see a mental health professional every month. Now, he’s a certified peer mentor at the Wounded Warrior Project helping other veterans who struggle with PTSD. McNabb heard about “Depicting the Invisible: A Portrait Series of Veteran Struggling with PTSD,” at a Freedom Fighters Outdoors veteran’s event. Barron was there, and approached him and his son, who is actually in his father’s old unit. She asked if McNabb wanted to participate, and he did. He needed to tell his story. 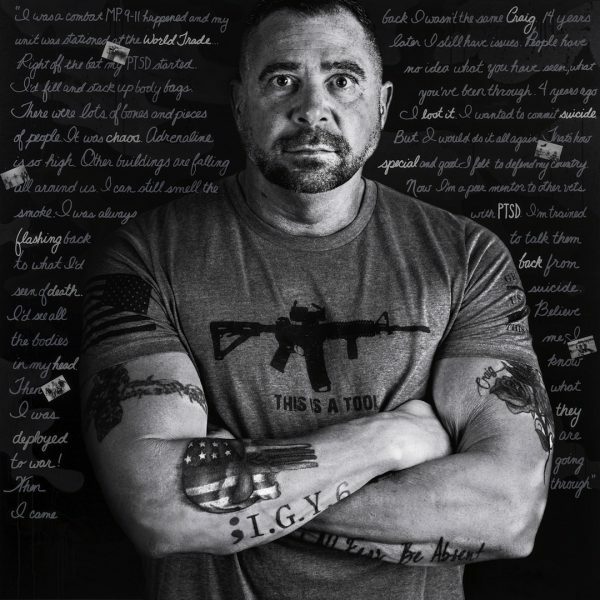 For his portrait, his personal story depicts the day his army unit responded to the September 11th attacks on the World Trade Center, and his subsequent deployment to Iraq. “Being a part of that book, it’s a family that can never be torn apart. It could be 10 years down the road and anybody in that book or anybody that I’ve served with can call me on anything, and I would jump for them. You don’t think twice,” McNabb explained. The process involved photographing the veterans and printing them on canvas. Then a black on black camouflage background was painted on the canvas. Furthermore, the veterans wrote, in their own words, their story that encircles the entire portrait. There are also collage elements, which are images from war that pop into the veterans’ minds that they can’t forget. “I think that these stories are really important to tell, and the authenticity and the veracity of the veteran’s story in their own words is a critical element to understanding the PTSD,” Barron told The Epoch Times. The portrait series is intended to be instructive and inspire hope. In fact, a veteran came in to view the portrait series when it debuted in New York and told Barron he had been contemplating suicide. He had tried to seek help at the Veteran’s Affairs department, but they were unable to help him. He heard about the gallery show on the radio, and he attended. The veteran diligently walked through the gallery, viewing each portrait and reading each story. He then went up to Barron and told her they were all portraits of him, and he didn’t know how many people felt the way he did. “I think it’s also important for civilians to understand what it is we ask our veterans to sacrifice when we put them in harm’s way,” Barron said. Veterans have told Barron that not only is important to talk about PTSD to save lives now, these stories need to be told so the next generation of veterans are in a better position to contend with PTSD. Furthermore, its critical to address this issue as more veterans have died at home than on the battlefields of Iraq and Afghanistan. Tragically, right before the gallery opening in New York Barron received a phone call. It was the mother of one of the veterans in the series, and she informed Barron that her son had taken his own life. To pay tribute to him, Barron added an art installation to the gallery. The interactive piece is called “The Table of the Fallen,” and features a dining room table set for one, with rose petals covering the floor. People are invited to sit at the table, and honor someone they lost. The portrait series has been featured at a gallery in New York and Miami, Florida, and will be featured at the Army Navy Club in Washington D.C. this February. Barron will continue to travel across the country, creating more portraits of veterans to add to the series. The series has also been published as an art book, and all of the proceeds have gone and will continue to go to organizations that help veterans. “We’re not invisible. The book actually says it, depicting the invisible. A lot of people think we’re invisible, but we’re not invisible. We’re here,” McNabb said. “I just hope people become more aware of how serious it [PTSD] is,” McNabb said. Veterans of the Iraq and Afghanistan wars showed a 50 percent improvement in their post-traumatic stress disorder (PTSD) following eight weeks of practicing meditation.